Every few months I have little low points revolving around hating city living. They're the worst in the summer when the weather is lovely. Funnily enough yesterday's stew started because of a random downpour during my thirty minute walk to work - the stuff of cats and dogs legend. By the time I arrived at my destination I was sopping wet and my shoes were twin above ground pools. My complaint: If I didn't live in the the city I could afford to have a car and a drive across town would keep me dry in bleak winter. As if this wasn't bad enough, later the sun came out and my lament became why didn't I buy a place with a balcony! Yes, there's a communal roof deck but it offer no form of shade and my internet signal doesn't register up there. This means it's not an option for working outdoors when the weather is good. 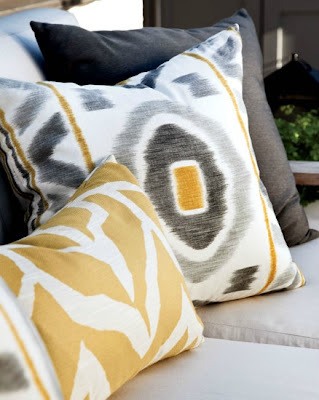 Of course, I continued to torture myself by browsing through killer outdoor spaces online. Here's one that I fell for instantly. I'm dying for the mustard yellow/charcoal accent colors. 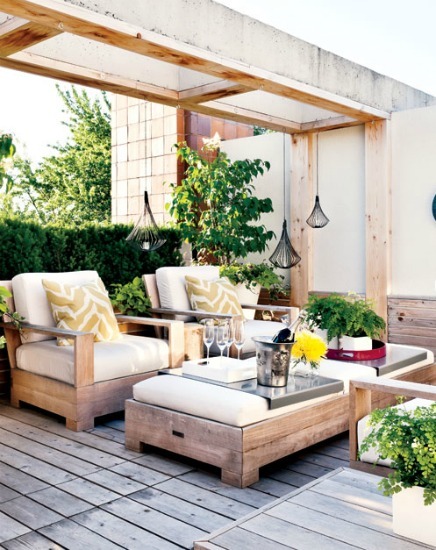 They look fantastic with the rustic wood tones of the furniture and deck material. Hello outdoor kitchen. You'll come live at my place, right? 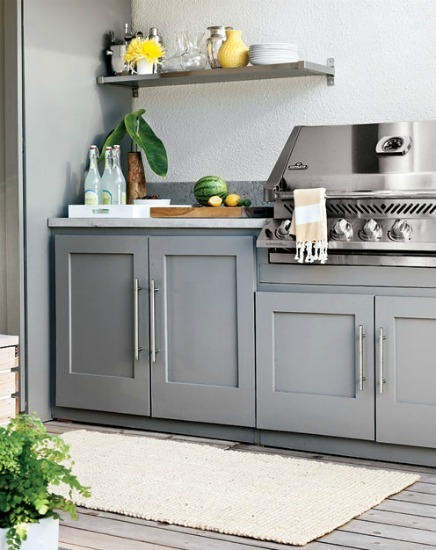 This outdoor space is nicer than my actual kitchen.